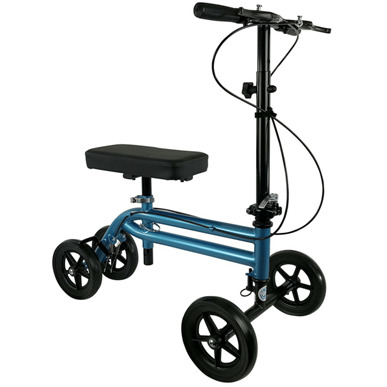 The Economy Knee Scooter Walker provides a more reliable and comfortable alternative to crutches for patients needing an effective mobility solution at an affordable price. The steerable economy knee walker delivers one of the best kneewalker values in the industry and is ideal for for individuals recovering from a broken foot, broken ankle, broken leg, foot surgery, ankle surgery, leg amputation, other lower leg injuries or medical conditions like ulcers. Sturdy dual bar frame, an adjustable locking handbrake and rear on-wheel brake deliver excellent stability and control. Ideal for indoor and outdoor use, the steerable knee scooter walker features four smooth 7.5" diameter rubber wheels. Compatible with both the right and left legs, the Economy Knee Scooter kneeling walker is lightweight and portable thanks to its simple folding mechanism that utilizes an easy to use thumb-release lever.